Generally, we work better and smarter, and our organizations are more transparent and collaborative, when we can work “out loud.” When we share work in progress with colleagues, they are better informed, and our work can inform their work. When we share what we don’t know, or mistakes we have made, we can learn in new ways and colleagues become invested in our work. When our work becomes more visible within our organization, opportunities for collaboration can be found and time can be saved. 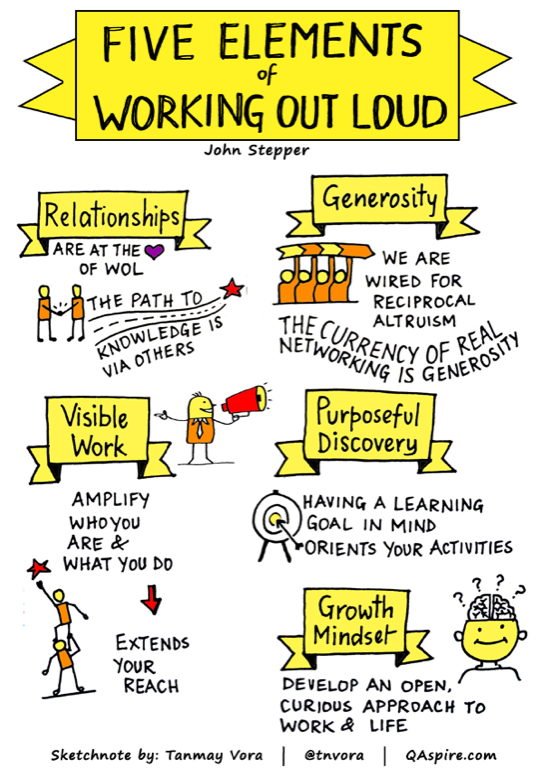 By reading the great Working Out Loud book by John Stepper, and bringing Working Out Loud circles to our organization to help make the lessons of Working Out Loud a meaningful practice and habit, our organization has begun to see culture and behavior change. People are more vulnerable. They are sharing more. They are not as afraid of mistakes as they once were. They are not as afraid of being vocal about what they don’t know. They want to be more collaborative, and are will to take risks to find opportunities for that collaboration. I recently came across the video for one of my favorite Bruce Springsteen performances (yes, I am a big fan) from Leipzig, Germany in 2013. Now that I have been a student of Working Out Loud for several months, I see this video with a new perspective. I see that this performance is actually a master class in Working Out Loud. Springsteen and his band had begun the practice of taking requests from the audience. Mostly, these requests were for songs from deep within the Springsteen catalog. Songs the band could easily plan upon request. But, every now and then, Springsteen would take the request for a song that the band had never played before, or had not played in decades. Unbeknownst to him, Springsteen is leading a Working Out Loud mega-circle. It is as if he carefully studied the Five Elements of Working Out Loud, and brought them to life for a stadium audience of 35,000 people. Relationships are at the heart of Working Out Loud. The path to knowledge is via others. Immediately upon taking the request, Springsteen looks to his band mates to find a good key for the song. Right by his side is his lifelong friend and band mate Steve Van Zandt. Van Zandt frowns at the keys Springsteen is trying to play. They debate back and forth, in front of the audience, about how the song should be played. It is because of the relationship that Springsteen has with Van Zandt, and because of the relationship that Springsteen has with his audience, that he is able to be so transparent in how he works. Generosity. We are wired for reciprocal altruism. The currency of real networking is generosity. Springsteen could put on an excellent concert with a set list determined only by him, but he chooses to do otherwise. With a spirit of generosity and vulnerability, Springsteen asks the audience what they want the band to play, even if it’s not one of their songs. Through this generosity, Springsteen symbolically brings the audience on stage with him. They are now part of the band. Everyone is in this together. Visible work. Amplify who you are and what you do. Now, the audience and the band are working together, and we are truly seeing how “the sausage is made.” Springsteen hums a melody so the horns will know what to play. “Try it boys.” 35,000 people are watching. “Help us out crowd” as they hum the part along as the horns learn their part. Then, somehow the band all kicks in and they are rockin! Purposeful discovery. Having a learning goal in mind orients your activities. But it’s not enough to just play the song. Springsteen explores the corners of the song. He calls on members of the band to take impromptu solos. Piano, followed by trombone, followed by trumpet. Springsteen does not have a plan, but he invites the audience and the band to discover this song along with him. Growth mindset. Develop an open, curious approach to work and life. There are few artists as talented or successful as Bruce Springsteen. A millionaire many times over. He can play the same songs night after night, and he would continue to fill stadiums. But Springsteen wants more. Even at 64 years old at the time of this performance, Springsteen seeks to continue to grow as an artist. Pushing himself and his band to do more. To be more creative. To be more curious. Watch the band look at Bruce, and at each other, as they make their way through this Chuck Berry classic. They all seem a little scared and very amused, all at the same time. Where is this going? Who plays next? How will this end? Somehow, this all works. Together, the audience and the band grow a little closer together through this joyous, curious and generous approach to rock and roll. Live on stage, with no plan in place, Bruce Springsteen works out loud. He makes his work visible. Relationships are developed through generosity. He and his band engage in purposeful discovery with a meaningful growth mindset. Bruce Springsteen. The E Street Band. 35,000 people. All working together.